For more than a decade, Jason T. Smith led the Back In Motion Health Group with a traditional organisational structure. For a while, it worked well. They were recognised in the BRW Fast Franchise list for five consecutive years as ANZ’s fastest-growing physiotherapy franchise – but then something changed. Jason set a new goal that couldn’t be achieved through the status quo. Their organisational model lacked critical design attributes needed for his team to unleash its innovative potential. It was time to overhaul. 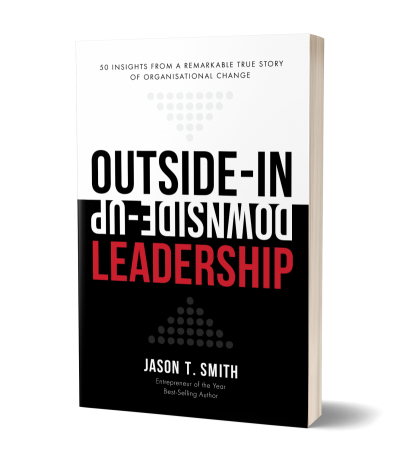 Regardless of whether you employ five people or lead a cohort of 5000, Outside-in Downside-Up Leadership provides a unique, practical framework for those who know their organisation is capable of so much more. This book is their story…warts and all! Peter Irvine, Co Founder, Gloria Jean’s Coffees Australia.